Microsoft is a multinational computer technology corporation. Microsoft was founded on April 4, 1975, by Bill Gates and Paul Allen in Albuquerque, New Mexico. Its current best-selling products are the Microsoft Windows operating system, Microsoft Office suite of productivity software, Xbox, a line of entertainment of games, music and video, and Bing, a line of search engines. In 1980, Microsoft formed a partnership with IBM to bundle Microsoft's operating system with IBM computers; with that deal, IBM paid Microsoft a royalty for every sale. In 1985, IBM requested Microsoft to develop a new operating system for their computers called OS/2. Microsoft produced that operating system, but also continued to sell their own alternative, which proved to be in direct competition with OS/2. Microsoft Windows eventually overshadowed OS/2 in terms of sales. When Microsoft launched several versions of Microsoft Windows in the 1990s, they had captured over 90% market share of the world's personal computers. As of June 30, 2015, Microsoft has a global annual revenue of $86.83 Billion USD and 128,076 employees worldwide. It develops, manufactures, licenses, and supports a wide range of software products for computing devices. 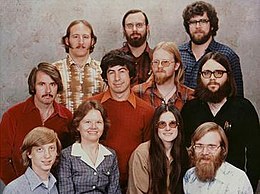 Gates described this photo in 2009 as "that famous picture that provides indisputable proof that your average computer geek from the late 1970s was not exactly on the cutting edge of fashion." The idea that would spawn Microsoft was initiated when Paul Allen showed Bill Gates the first of January, 1975 issue of Popular Electronics that demonstrated the Altair 8800. Allen and Gates saw potential to develop an implementation of the programming language BASIC interpreter for the system. Bill Gates called the creators of the new microcomputer, Micro Instrumentation and Telemetry Systems (MITS), offering to demonstrate the implementation in order to win a contract with the company. Allen and Gates had neither an interpreter nor an Altair system, yet in the eight weeks before the demo, they developed an interpreter. When Allen flew to Albuquerque to meet with MITS, the interpreter worked and MITS agreed to distribute Altair BASIC. Allen and Gates left Boston, where Allen worked for Honeywell and Gates was enrolled in Harvard, moved to Albuquerque (where MITS was located), and co-founded Microsoft there. Revenues of the company totalled $16,005 by the end of 1976. Allen came up with the original name of Micro-Soft, a portmanteau of microcomputer and software. Hyphenated in its early incarnations, on November 26, 1976 the company was registered under that name with the Secretary of State of New Mexico. The company's first international office was founded on November 1, 1978, in Japan, entitled "ASCII Microsoft" (now called "Microsoft Japan"), and on November 29, 1979, the term, "Microsoft" was first used by Bill Gates. On January 1, 1979, the company moved from Albuquerque to a new home in Bellevue, Washington, since it was hard to recruit top programmers to Albuquerque. Shortly before the move, eleven of the then-thirteen employees posed for the staff photo on the right. Steve Ballmer joined the company on June 11, 1980, and would later succeed Bill Gates as CEO from January 2000 until February 2014. The company restructured on June 25, 1981, to become an incorporated business in its home state of Washington (with a further change of its name to "Microsoft Corporation, Inc."). As part of the restructuring, Bill Gates became president of the company and chairman of the board, and Paul Allen became Executive Vice President. Microsoft's early products were different variants of Microsoft BASIC which was the dominant programming language in late 1970s and early 1980s home computers such as Apple II (Applesoft BASIC) and Commodore 64 (Commodore BASIC), and were also provided with early versions of the IBM PC as the IBM Cassette BASIC. Microsoft also marketed through an Apple dealer in West Palm Beach, Florida two products for the Radio-Shack TRS-80. One was "Typing Tutor" which led the user through learning to use a keyboard. The other was authored by a professor at the University of Hawaii called "MuMATH" and had the ability to do mathematics in long integer math to avoid floating point numbers. The first hardware product was the Z-80 SoftCard which enabled the Apple II to run the CP/M operating system, at the time an industry-standard operating system for running business software and many compilers and interpreters for several high-level languages on microcomputers. The SoftCard was first demonstrated publicly at the West Coast Computer Faire in March 1980. It was an immediate success; 5,000 cards, a large number given the microcomputer market at the time, were purchased in the initial three months at $349 each and it was Microsoft's number one revenue source in 1980. The first operating system publicly released by the company was a variant of Unix announced on August 25, 1980. Acquired from AT&T through a distribution license, Microsoft dubbed it Xenix, and hired Santa Cruz Operation in order to port/adapt the operating system to several platforms. This Unix variant would become home to the first version of Microsoft's word processor, Microsoft Word. Originally titled "Multi-Tool Word", Microsoft Word became notable for its use of "What You See Is What You Get", or WYSIWYG pioneered by the Xerox Alto and the Bravo text editor in the 1970s. Word was first released in the spring of 1983, and free demonstration copies of the application were bundled with the November 1983 issue of PC World, making it one of the first program to be distributed on-disk with a magazine. (Earlier magazine on-disk distributions included Robert Uiterwyk's BASIC, in the May 1977 issue of Information Age See: http://www.swtpc.com/mholley/BASIC_2/Uiterwyk.htm)  However, Xenix was never sold to end users directly although it was licensed to many software OEMs for resale. It grew to become the most popular version of Unix, measured by the number of machines running it (note that Unix is a multi-user operating system, allowing simultaneous access to a machine by several users). By the mid-1980s Microsoft had gotten out of the Unix business, except for an interest in SCO. DOS (Disk Operating System) was the operating system that brought the company its real success. IBM first approached Microsoft about its upcoming IBM Personal Computer (IBM PC) in July 1980. On August 12, 1981, after negotiations with Digital Research failed, IBM awarded a contract to Microsoft to provide a version of the CP/M operating system, which was set to be used in the IBM PC. For this deal, Microsoft purchased a CP/M clone called 86-DOS from Tim Paterson of Seattle Computer Products for less than US$100,000, which IBM renamed to IBM PC DOS. The original CP/M was made by Gary Kildall of Digital Research, Inc. Microsoft did not have an operating system when they closed the deal with IBM and IBM had not done their homework. Due to potential copyright infringement problems with CP/M, IBM marketed both CP/M and PC DOS for US$240 and US$40, respectively, with PC DOS eventually becoming the standard because of its lower price. 35 of the company's 100 employees worked on the IBM project for more than a year. When the IBM PC debuted, Microsoft was the only company that offered operating system, programming language, and application software for the new computer. The IBM PC DOS is also known as MS-DOS. In 1983, in collaboration with numerous companies, Microsoft created a home computer system, MSX, which contained its own version of the DOS operating system, called MSX-DOS; this became relatively popular in Japan, Europe and South America. Later, the market saw a flood of IBM PC clones after Columbia Data Products successfully cloned the IBM BIOS, quickly followed by Eagle Computer and Compaq. The deal with IBM allowed Microsoft to have control of its own QDOS derivative, MS-DOS, and through aggressive marketing of the operating system to manufacturers of IBM-PC clones Microsoft rose from a small player to one of the major software vendors in the home computer industry. With the release of the Microsoft Mouse on May 2, 1983, Microsoft continued to expand its product line in other markets. This expansion included Microsoft Press, a book publishing division, on July 11 the same year, which debuted with two titles: Exploring the IBM PCjr Home Computer by Peter Norton, and The Apple Macintosh Book by Cary Lu. The sign at a main entrance to the Microsoft corporate campus. The Redmond campus today includes more than 8 million square feet (approx. 750,000 m²) and 28,000 employees. Ireland became home to one of Microsoft's international production facilities in 1985, and on November 20 Microsoft released its first retail version of Microsoft Windows (Windows 1.0), originally a graphical extension for its MS-DOS operating system. In August, Microsoft and IBM partnered in the development of a different operating system called OS/2. OS/2 was marketed in connection with a new hardware design proprietary to IBM, the PS/2. On February 16, 1986, Microsoft relocated their headquarters to a corporate office campus in Redmond, Washington. Around one month later, on March 13, the company went public with an IPO, raising US$61 million at US$21.00 per share. By the end of the trading day, the price had risen to US$28.00. In 1987, Microsoft eventually released their first version of OS/2 to OEMs. By then the company was the world's largest producer of software for personal computers—ahead of former leader Lotus Development—and published the three most-popular Macintosh business applications. That year the company purchased Forethought, the developer of PowerPoint and Microsoft's first major software acquisition on the 30th July 1987. Meanwhile, Microsoft began introducing its most prominent office products. Microsoft Works, an integrated office program which combined features typically found in a word processor, spreadsheet, database and other office applications, saw its first release as an application for the Apple Macintosh towards the end of 1986. Microsoft Works would later be sold with other Microsoft products including Microsoft Word and Microsoft Bookshelf, a reference collection introduced in 1987 that was the company's first CD-ROM product. Later, on August 8, 1989, Microsoft introduced its most successful office product, Microsoft Office. Unlike the model of Microsoft Works, Microsoft Office was a bundle of separate office productivity applications, such as Microsoft Word, Microsoft Excel and so forth. While Microsoft Word and Microsoft Office were mostly developed internally, Microsoft also continued its trend of rebranding products from other companies, such as Microsoft SQL Server on January 13, 1988, a relational database management system for companies that was based on technology licensed from Sybase. On May 22, 1990 Microsoft launched Windows 3.0. The new version of Microsoft's operating system boasted new features such as streamlined graphic user interface GUI and improved protected mode ability for the Intel 386 processor; it sold over 100,000 copies in two weeks. Windows at the time generated more revenue for Microsoft than OS/2, and the company decided to move more resources from OS/2 to Windows. In an internal memo to Microsoft employees on May 16, 1991, Bill Gates announced that the OS/2 partnership was over, and that Microsoft would henceforth focus its platform efforts on Windows and the Windows NT kernel. Some people, especially developers who had ignored Windows and committed most of their resources to OS/2, were taken by surprise, and accused Microsoft of deception. This changeover from OS/2 was frequently referred to in the industry as "the head-fake". In the recent years, the popularity of OS/2 declined, and Windows quickly became the favored PC platform. 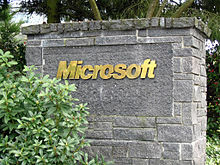 1991 also marked the founding of Microsoft Research, an organization in Microsoft for researching computer science subjects, and Microsoft Visual Basic, a popular development product for companies and individuals. The Microsoft sign at the entrance of the German Microsoft campus, Konrad-Zuse-Str. 1, Unterschleißheim, Germany. Microsoft became an international company with headquarters in many countries. During the transition from MS-DOS to Windows, the success of Microsoft's product Microsoft Office allowed the company to gain ground on application-software competitors, such as WordPerfect and Lotus 1-2-3. Novell, an owner of WordPerfect for a time, alleged that Microsoft used its inside knowledge of the DOS and Windows kernels and of undocumented Application Programming Interface features to make Office perform better than its competitors. Eventually, Microsoft Office became the dominant business suite, with a market share far exceeding that of its competitors. In March 1992, Microsoft released Windows 3.1 along with its first promotional campaign on TV; the software sold over three million copies in its first two months on the market. In October, Windows for Workgroups 3.1 was released with integrated networking abilities such as peer-to-peer file and printing sharing. In November, Microsoft released the first version of their popular database software Microsoft Access. The Microsoft sign at the entrance of the Dubai Microsoft campus, Dubai Internet City. Microsoft has developed Arabic versions for most of its products. By 1993, Windows had become the most widely used GUI operating system in the world. Fortune Magazine named Microsoft as the "1993 Most Innovative Company Operating in the U.S." The year also marked the end of a five-year copyright infringement legal case brought by Apple Computer, dubbed Apple Computer, Inc. v. Microsoft Corp., in which the ruling was in Microsoft's favor. Microsoft also released Windows for Workgroups 3.11, a new version of the consumer line of Windows, and Windows NT 3.1, a server-based operating system with a similar user interface to consumer versions of the operating system, but with an entirely different kernel. As part of its strategy to broaden its business, Microsoft released Microsoft Encarta on March 22, 1993, the first encyclopedia designed to run on a computer. Soon after, the Microsoft Home brand was introduced – encompassing Microsoft's new multimedia applications for Windows 3.x., Microsoft changed its slogan to "Where do you want to go today?" in 1994 as part of an attempt to appeal to nontechnical audiences in a US$100 million advertising campaign. Microsoft continued to make strategic decisions directed at consumers. The company released Microsoft Bob, a graphical user interface designed for novice computer users, in March 1995. The interface was discontinued in 1996 due to poor sales; Bill Gates later attributed its failure to hardware requirements that were too high for typical computers, and is widely regarded as one of Microsoft's most unsuccessful products.[why?] DreamWorks SKG and Microsoft formed a new company, DreamWorks Interactive (in 2000 acquired by Electronic Arts which named it EA Los Angeles), to produce interactive and multimedia entertainment properties. On August 24, 1995, Microsoft released Windows 95, a new version of the company's flagship operating system which featured a completely new user interface, including a novel start button; more than a million copies were sold in the first four days after its release. Windows 95 was released without a web browser as Microsoft had not yet developed one. The success of the web caught them by surprise and they subsequently approached Spyglass to license their browser as Internet Explorer. Spyglass went on to later dispute the terms of the agreement, as Microsoft was to pay a royalty for every copy sold. However, Microsoft sold no copies of Internet Explorer, choosing instead to bundle it for free with the operating system. Internet Explorer was first included in the Windows 95 Plus! Pack that was released in August 1995. In September, the Chinese government chose Windows to be the operating system of choice in that country, and entered into an agreement with the company to standardize a Chinese version of the operating system. Microsoft also released the Microsoft Sidewinder 3D Pro joystick in an attempt to further expand its profile in the computer hardware market. On May 26, 1995, Bill Gates sent the "Internet Tidal Wave" memorandum to Microsoft executives. The memo described Netscape with their Netscape Navigator as a "new competitor 'born' on the Internet." The memo outlines Microsoft's failure to grasp the Internet's importance, and in it Gates assigned "the Internet the highest level of importance" from then on. Microsoft began to expand its product line into computer networking and the World Wide Web. On August 24, 1995, it launched a major online service, MSN (Microsoft Network), as a direct competitor to AOL. MSN became an umbrella service for Microsoft's online services, using Microsoft Passport (now called a Microsoft account) as a universal login system for all of its web sites. The company continued to branch out into new markets in 1996, starting with a joint venture with NBC to create a new 24-hour cable news television station, MSNBC. The station was launched on July 15, 1996 to compete with similar news outlets such as CNN. Microsoft also launched Slate, an online magazine edited by Michael Kinsley, which offered political and social commentary along with the cartoon Doonesbury. In an attempt to extend its reach in the consumer market, the company acquired WebTV, which enabled consumers to access the Web from their televisions. Microsoft entered the personal digital assistant (PDA) market in November with Windows CE 1.0, a new built-from-scratch version of their flagship operating system, designed to run on low-memory, low-performance machines, such as handhelds and other small computers. 1996 saw the release of Windows NT 4.0, which brought the Windows 95 GUI and Windows NT kernel together. While Microsoft largely failed to participate in the rise of the Internet in the early 1990s, some of the key technologies in which the company had invested to enter the Internet market started to pay off by the mid-90s. One of the most prominent of these was ActiveX, an application programming interface built on the Microsoft Component Object Model (COM); this enabled Microsoft and others to embed controls in many programming languages, including the company's own scripting languages, such as JScript and VBScript. ActiveX included frameworks for documents and server solutions. The company also released the Microsoft SQL Server 6.5, which had built-in support for internet applications. Later in 1997, Microsoft Office 97 as well as Internet Explorer 4.0 were released, marking the beginning of the takeover of the browser market from rival Netscape, and by agreement with Apple Computer, Internet Explorer was bundled with the Apple Macintosh operating system as well as with Windows. Windows CE 2.0, the handheld version of Windows, was released this year, including a host of bug fixes and new features designed to make it more appealing to corporate customers. In October, the Justice Department filed a motion in the federal district court in which they stated that Microsoft had violated an agreement signed in 1994, and asked the court to stop the bundling of Internet Explorer with Windows. The year 1998 was significant in Microsoft's history, with Bill Gates appointing Steve Ballmer as president of Microsoft but remaining as Chair and CEO himself. The company released an update to the consumer version of Windows, Windows 98. Windows 98 came with Internet Explorer 4.0 SP1 (which had Windows Desktop Update bundled), and included new features from Windows 95 OSR 2.x including the FAT32 file system, and new features designed for Windows 98, such as support for multiple displays. Microsoft launched its Indian headquarters as well, which would eventually become the company's second largest after its U.S. headquarters. Finally, a great deal of controversy took place when a set of internal memos from the company were leaked on the Internet. These documents, colloquially referred to as "The Halloween Documents", were widely reported by the media and went into detail of the threats that free software / open source software poses to Microsoft's own software, previously voiced mainly by analysts and advocates of open source software. The documents also alluded to legal and other actions against Linux as well as other open source software. While Microsoft acknowledged the documents, it claimed that they are merely engineering studies. Despite this, some believe that these studies were used in the real strategies of the company. Microsoft, in 2000, released new products for all three lines of the company's flagship operating system, and saw the beginning of the end of one of its most prominent legal cases. On February 17, Microsoft released an update to its business line of software in Windows 2000. It provided a high level of stability similar to that of its Unix counterparts due to its usage of the Windows NT kernel, and matching features found in the consumer line of the Windows operating system including a DOS emulator that could run many legacy DOS applications. On April 3, 2000, a judgment was handed down in the case of United States v. Microsoft Corp., calling the company an "abusive monopoly" and forcing the company to split into two separate units. Part of this ruling was later overturned by a federal appeals court, and eventually settled with the U.S. Department of Justice in 2001. On June 15, 2000, the company released a new version of its hand-held operating system, Windows CE 3.0. The main change was the new programming APIs of the software. Previous versions of Windows CE supported only a small subset of the WinAPI, the main development library for Windows, and with Version 3 of Windows CE, the operating system now supported nearly all of the core functionality of the WinAPI. The next update to the consumer line, Windows ME (or Windows Millennium Edition), was released on September 14, 2000. It sported several new features such as enhanced multimedia abilities and consumer-oriented PC maintenance options, but is often regarded as one of the worst versions of Windows due to stability problems, restricted real mode DOS support and other issues. Windows XP introduced a new interface, along with many other new features. This screenshot shows Windows XP Professional. Microsoft released Windows XP and Office XP in 2001, a version that aimed to encompass the features of both its business and home product lines. The release included an updated version of the Windows 2000 kernel, enhanced DOS emulation abilities, and many of the home-user features found in previous consumer versions. XP introduced a new graphical user interface, the first such change since Windows 95. The operating system was the first to require Microsoft Product Activation, an anti-piracy mechanism that requires users to activate the software with Microsoft within 30 days. Later, Microsoft would enter the multibillion-dollar game console market dominated by Sony and Nintendo, with the release of the Xbox. The Xbox finished behind the dominant PlayStation 2 selling 24 million units compared to 155 million overall; however they managed to outsell the GameCube which sold 21 million units. Microsoft launched their second console, the Xbox 360, in 2005 – which has turned out to be a lot more successful than their first console. It has sold 40 million units as of 2010 and it has outsold Sony's PlayStation 3 which has so far sold 35 million units. However, despite beating Sony with their last Xbox console, Microsoft so far has been outsold by the Wii which introduced gesture control and opened up a new market for video games. Microsoft later used their popular controller-free Kinect peripheral to increase the popularity of the Xbox. This was very successful. As of 2011[update] Kinect was the fastest selling consumer electronics product in history. It sold 8 million units from November 4, 2010 to January 3, 2011 (its first 60 days). It averaged 133,333 units per day, outselling the iPhone and iPad over equivalent post-launch periods. In 2002, Microsoft launched the .NET initiative, along with new versions of some of its development products, such as Microsoft Visual Studio. The initiative has been an entirely new development API for Windows programming, and included a new programming language, C#. Windows Server 2003 was launched, featuring enhanced administration abilities, such as new user interfaces to server tools. In 2004, the company released Windows XP Media Center Edition 2005, a version of Windows XP designed for multimedia abilities, and Windows XP Starter Edition, a version of Windows XP with a smaller feature set designed for entry-level consumers. However, Microsoft encountered more turmoil in March 2004 when antitrust legal action would be brought against it by the European Union for allegedly abusing its market dominance (see Microsoft Corp v Commission). Eventually Microsoft was fined €497 million (US$613 million), ordered to divulge certain protocols to competitors, and to produce a new version of its Windows XP platform—called Windows XP Home Edition N—that did not include its Windows Media Player. Microsoft was also ordered to produce separate packages of Windows after South Korea also landed a settlement against the company in 2005. It had to pay out US$32 million and produce more than one version of Windows for the country in the same vein as the European Union-one with Windows Media Player and Windows Messenger and one without the two programs. In guise of competing with other Internet Companies such as the search service Google, in 2005 Microsoft announced a new version of its MSN search service. Later, in 2006, the company launched Microsoft adCenter, a service that offers pay per click advertisements, in an effort to further develop their search marketing revenue. Soon afterward, Microsoft created the CodePlex collaborative development site for hosting open source projects. Activity grew quickly as developers from around the world began to participate, and by early 2007 commercial open source companies, such as Aras Corp,. began to offer enterprise open source software exclusively on the Microsoft platform. On June 15, 2006, Bill Gates announced his plans for a two-year transition period out of a day-to-day role with Microsoft until July 31, 2008. After that date, Gates will continue in his role as the company's chairman, head of the board of directors and act as an adviser on key projects. His role as Chief Software Architect will be filled immediately by Ray Ozzie, the Chief Technical Officer of the company as of June 15, 2006. Bill Gates stated "My announcement is not a retirement – it’s a reordering of my priorities." Formerly codenamed "Longhorn" in the early development stages, Windows Vista was released to consumers on January 30, 2007. Microsoft also released a new version of its Office suite, called Microsoft Office 2007, alongside Windows Vista. Windows Server 2008 and Visual Studio 2008, the next versions of the company's server operating system and development suite, respectively, were released on February 27, 2008. Windows Vista was criticized for being heavy and needing large amounts of power to run the desktop widgets and the Aero theme. Many people continued to use Windows XP for many years after, due to its stability and low processing needs. On December 19, 2007, Microsoft signed a five-year, $500 million contract with Viacom that included content sharing and advertisements. The deal allowed Microsoft to license many shows from Viacom owned cable television and film studios for use on Xbox Live and MSN. The deal also made Viacom a preferred publisher partner for casual game development and distribution through MSN and Windows. On the advertisement side of the deal, Microsoft's Atlas ad-serving division became the exclusive provider of previously unsold advertising inventory on Viacom owned web sites. Microsoft also purchased a large amount of advertising on Viacom owned broadcasts and online networks, and collaborated on promotions and sponsorships for MTV and BET award shows, two Viacom owned cable networks. In 2008, Microsoft wanted to purchase Yahoo (first completely, later partially) in order to strengthen its position on the search engine market vis-à-vis Google. The company rejected the offer, saying that it undervalued the company. In response, Microsoft withdrew its offer. In 2009, the opening show of the Consumer Electronics Show (CES) was hosted by Steve Ballmer for the first time. In past years, it has been hosted by Bill Gates. During the show, Ballmer announced the first public Beta Test of Windows 7 for partners and developers on January 8, but also for the general public two days later. On June 26, 2009, Microsoft started taking pre-orders at a discounted price for Windows 7 which was launched on October 22, 2009. Windows 7 has several editions, which acknowledge the rise of netbook computers with reduced processing power. On May 10, 2011, the company acquired Skype Technologies for US $8.5 billion. Following the release of Windows Phone, Microsoft underwent a gradual rebranding of its product range throughout 2011 and 2012—the corporation's logos, products, services and websites adopted the principles and concepts of the Metro design language. Microsoft previewed Windows 8, an operating system designed to power both personal computers and tablet computers, in Taipei in June 2011. A developer preview was released on September 13, and was replaced by a consumer preview on February 29, 2012. On May 31, 2012, the preview version was released. On June 18, 2012, Microsoft unveiled the Surface, the first computer in the company's history to have its hardware made by Microsoft. On June 25, Microsoft paid US$1.2 billion to buy the social network Yammer. On July 31, 2012, Microsoft launched the Outlook.com webmail service to compete with Gmail. On September 4, 2012, Microsoft released Windows Server 2012. In July 2012, Microsoft sold its 50% stake in MSNBC.com, which it had run as a joint venture with NBC since 1996. On October 1, Microsoft announced its intention to launch a news operation, part of a new-look MSN, at the time of the Windows 8 launch that was later in the month. On October 26, 2012, Microsoft launched Windows 8 and the Microsoft Surface. Three days later, Windows Phone 8 was launched. To cope with the potential for an increase in demand for products and services, Microsoft opened a number of "holiday stores" across the U.S. to complement the increasing number of "bricks-and-mortar" Microsoft Stores that opened in 2012. On March 29, 2013, Microsoft launched a Patent Tracker. The Kinect, a motion-sensing input device made by Microsoft and designed as a video game controller, was first introduced in November 2010, and was upgraded for the 2013 release of the eighth-generation Xbox One video game console. Kinect's capabilities were revealed in May 2013. The new Kinect uses an ultra-wide 1080p camera, which can function in the dark due to an infrared sensor. It employs higher-end processing power and new software, can distinguish between fine movements (such as a thumb movements), and can determine a user's heart rate by looking at his/her face. Microsoft filed a patent application in 2011 that suggests that the corporation may use the Kinect camera system to monitor the behavior of television viewers as part of a plan to make the viewing experience more interactive. On July 19, 2013, Microsoft stocks suffered its biggest one-day percentage sell-off since the year 2000 after its fourth-quarter report raised concerns among the investors on the poor showings of both Windows 8 and the Surface tablet; with more than 11 percentage points declining Microsoft suffered a loss of more than US$32 billion. For the 2010 fiscal year, Microsoft had five product divisions: Windows Division, Server and Tools, Online Services Division, Microsoft Business Division and Entertainment and Devices Division. On September 3, 2013, Microsoft agreed to buy Nokia's mobile unit for $7 billion. Also in 2013, Amy Hood became the CFO of Microsoft. The Alliance for Affordable Internet (A4AI) was launched in October 2013 and Microsoft was part of the coalition of public and private organizations that also included Facebook, Intel and Google. Led by World Wide Web inventor Tim Berners-Lee, the A4AI seeks to make Internet access more affordable so that access is broadened in the developing world, where only 31% of people are online. Google will help to decrease Internet access prices so that they fall below the UN Broadband Commission's worldwide target of 5% of monthly income. In line with the maturing PC business, in July 2013, Microsoft announced that it would reorganize the business into four new business divisions by function: Operating System, Apps, Cloud, and Devices. All previous divisions were diluted into new divisions without any workforce cuts. On February 4, 2014, Steve Ballmer stepped down as CEO of Microsoft and was succeeded by Satya Nadella, who previously led Microsoft's Cloud and Enterprise division. On the same day, John W. Thompson took on the role of chairman, with Bill Gates stepping down from the position, while continuing to participate as a technology advisor. On April 25, 2014, Microsoft acquired Nokia Devices and Services for $7.2 billion. The new subsidiary was renamed Microsoft Mobile Oy. In May 2016, the company announced it will lay off 1,850 workers, taking an impairment and restructuring charge of $950 million. During the previous summer of 2015 the company wrote down $7.6 billion related to its mobile-phone business and fired 7,800 employees from those operations. On September 15, 2014, Microsoft acquired the video game development company Mojang, best known for its wildly popular flagship game Minecraft, for $2.5 billion. On January 21, 2015, Microsoft announced the release of their first Interactive whiteboard, Microsoft Surface Hub (part of the Surface family). On July 29, 2015, Microsoft released the next version of the Windows operating system, Windows 10. Its server sibling, Windows Server 2016, was released in September 2016. In Q1 2015, Microsoft was the third largest maker of mobile phones selling 33 million units (7.2% of all), while a large majority (at least 75%) of them do not run any version of Windows Phone – those other phones are not categorized as smartphones by Gartner – in the same time frame 8 million Windows smartphones (2.5% of all smartphones) were made by all manufacturers (but mostly by Microsoft). Microsoft's share of the U.S. smartphone market in January 2016 was 2.7%. On March 1, 2016, Microsoft announced the merge of its PC and Xbox divisions, with Phil Spencer announcing that Universal Windows Platform (UWP) apps would be the focus for Microsoft's gaming in the future. In June 2016, Microsoft announced a project named Microsoft Azure Information Protection. It aims to help enterprises protect their data as it moves between servers and devices. In November 2016, Microsoft joined the Linux Foundation as a Platinum member during Microsoft’s Connect(); developer event in New York. The cost of each Platinum membership is US$500,000 per year. Some analysts deemed this unthinkable ten years prior; however in 2001, then-CEO Steve Ballmer called Linux "cancer". On January 24, 2017, Microsoft showcased Intune for Education at the BETT 2017 education technology conference in London. Intune for Education is a new cloud-based application and device management service for the education sector. Microsoft will launch a preview of Intune for Education "in the coming weeks", with general availability scheduled for spring 2017, priced at $30 per device, or through volume licensing agreements. On June 8, 2017, Microsoft acquired Hexadite, an Israeli security firm, for $100 million. In August 2018, Toyota Tsusho began a partnership with Microsoft to create fish farming tools using the Microsoft Azure application suite for IoT technologies related to water management. Developed in part by researchers from Kindai University, the water pump mechanisms use artificial intelligence to count the number of fish on a conveyor belt, analyze the number of fish, and deduce the effectiveness of water flow from the data the fish provide. The specific computer programs used in the process fall under the Azure Machine Learning and the Azure IoT Hub platforms. On 10 October, 2018, Microsoft joined the Open Invention Network community despite holding more than 60,000 patents. On 16 October, 2018, Paul Allen the co-founder of Microsoft passed away after complications of non-Hodgkin's lymphoma. In November 2018, Microsoft agreed to supply 100,000 HoloLens headsets to the United States military in order to "increase lethality by enhancing the ability to detect, decide and engage before the enemy." In December 2018, Microsoft announced Project Mu, an open source release of the UEFI core used in Microsoft Surface and Hyper-V products. The project promotes the idea of Firmware as a Service. In the same month, Microsoft announced the open source implementation of Windows Forms and the Windows Presentation Foundation (WPF) which will allow for further movement of the company toward the transparent release of key frameworks used in developing Windows desktop applications and software. December also saw the company discontinue the Microsoft Edge project in favor of Chromium backends for their browsers. On 20 February 2019, Microsoft Corp said it will offer its cyber security service AccountGuard to 12 new markets in Europe including Germany, France and Spain, to close security gaps and protect customers in political space from hacking. In February 2019, hundreds of Microsoft employees protested the company's war profiteering from a $480 million contract to develop VR headsets for the United States army. ^ "Bill Gates: A Timeline". BBC News. June 15, 2006. Archived from the original on June 22, 2006. Retrieved July 3, 2006. ^ "Microsoft 2014 Facts". Archived from the original on January 13, 2015. Retrieved October 22, 2014. ^ "Microsoft 2005 Annual Report". Archived from the original (DOC) on October 8, 2005. Retrieved October 1, 2005. ^ "Fast Facts About Microsoft". microsoft.com. Microsoft Corporation. August 1, 2007. Archived from the original on August 9, 2007. Retrieved August 15, 2007. ^ MSFT Investor Relations (July 19, 2007). "Microsoft Fourth Quarter FY 2007 Earnings Release: Microsoft's Annual Revenue Surpasses $50 Billion". microsoft.com. Microsoft Corporation. Archived from the original on September 12, 2007. Retrieved August 15, 2007. ^ Paul Allen (April 19, 2011). Idea Man: A Memoir by the Cofounder of Microsoft. Penguin Group US. p. 85. ISBN 978-1-101-47645-1. Archived from the original on July 4, 2014. ^ "Bill Gates: My 1979 Memories". Archived from the original on January 9, 2013. Retrieved November 30, 2012. ^ a b c d e f g h i j k l m n o p q r s t u v w x "What We'll Miss About Bill Gates – a Very Long Good-Bye". Wired. May 19, 2008. Archived from the original on April 19, 2014. Retrieved May 3, 2011. ^ a b c d e f g h i j k l m n o p q r s t u v w "Microsoft Company 15 September 1975". The History of Computing Project. Archived from the original on July 23, 2005. Retrieved August 11, 2005. ^ Alfred, Randy. "April 4, 1975: Bill Gates, Paul Allen Form a Little Partnership". Wired Magazine. Archived from the original on May 15, 2013. Retrieved May 20, 2013. ^ Gates, Bill (October 2, 1995). "Bill Gates & Paul Allen Talk". CNN. Archived from the original on May 3, 2011. Retrieved May 3, 2011. ^ "Iconic Albuquerque Photo Re-Created". Archived from the original on April 24, 2014. Retrieved March 31, 2014. ^ Lock, Robert (May – June 1980). "An Apple Breakthru". Compute!. p. 6. Retrieved October 25, 2013. ^ "Z-80 Board Puts CP/M on Apple". InfoWorld. Popular Computing. 2 (6): 3. April 28, 1980. ISSN 0199-6649. Archived from the original on March 14, 2017. ^ Ballmer, Steve. "Microsoft Surface Keynote". Archived from the original on June 20, 2012. Retrieved June 19, 2012. ^ a b Jason Levitt (June 12, 2000). "Is It Time Again For Microsoft And Unix?". Information Week. Archived from the original on November 5, 2006. Retrieved April 29, 2006. ^ Dafydd Neal Dyar (November 4, 2002). "Under The Hood: Part 8". Computer Source. Archived from the original on September 1, 2006. Retrieved July 4, 2006. ^ hjk "Xerox Alto – CHM Revolution" Check |url= value (help). Archived from the original on January 2, 2015. Retrieved August 27, 2014. ^ "BRAVO text editor screen – CHM Revolution". Archived from the original on October 14, 2014. Retrieved August 27, 2014. ^ A. Allen, Roy (October 2001). "Chapter 12: Microsoft in the 1980s" (PDF). A History of the Personal Computer: The People and the Technology (1st ed.). Allan Publishing. pp. 12–13. Archived from the original on July 2, 2006. Retrieved July 4, 2006. ^ Leffler, Samuel J.; et al. (October 1989). The Design and Implementation of the 4.3BSD UNIX Operating System. Addison-Wesley. p. 7. ISBN 0-201-06196-1. ^ a b Bunnell, David (February – March 1982). "The Man Behind The Machine? / A PC Exclusive Interview With Software Guru Bill Gates". PC Magazine. p. 16. Archived from the original on May 9, 2013. Retrieved February 17, 2012. ^ "Digital Research History". Archived from the original on July 2, 2006. Retrieved July 3, 2006. ^ Gordon, John Steele; Maiello, Michael (December 23, 2002). "Pioneers Die Broke". Forbes. Archived from the original on October 29, 2006. Retrieved July 5, 2006. ^ "comp.sys.msx FAQ". Archived from the original on December 3, 2008. Retrieved October 14, 2005. ^ "MSX History". OLD-COMPUTERS.COM. Archived from the original on May 8, 2006. Retrieved July 4, 2006. ^ "Booting Your PC: Getting Up Close & Personal With A Computer's BIOS". Smart Computing. November 1999. Archived from the original on November 11, 2006. Retrieved September 2, 2006. ^ "What Is The BIOS?". Smart Computing. July 1994. Archived from the original on November 11, 2006. Retrieved September 2, 2006. ^ "Everything You Want or Need to Know About Your BIOS". Extreme Tech. Archived from the original on December 2, 2007. Retrieved September 2, 2006. ^ "Appendix B" (PDF). Intellectual Property in the New Technological Age. ISBN 0-7355-3652-X. Archived (PDF) from the original on September 3, 2006. Retrieved September 2, 2006. "MS-DOS and PC DOS". Lexikon's History of Computing. Archived from the original on June 24, 2006. Retrieved July 5, 2006. "When It Comes To DOS, You Now Have A Choice". Smart Computing. June 1994. Archived from the original on November 11, 2006. Retrieved July 5, 2006. "Microsoft to Microsoft disk operating system (MS-DOS)". Smart Computing. March 2002. Archived from the original on November 11, 2006. Retrieved July 5, 2006. ^ Seattle Post-Intelligencer Staff (May 18, 2005). "Redmond council OKs Microsoft expansion". Seattle Post-Intelligencer. Retrieved July 4, 2006. ^ "Techworld Article:OS/2 users must look elsewhere". Archived from the original on August 13, 2007. Retrieved August 5, 2005. ^ "Microsoft OS/2 announcement". Archived from the original on April 10, 2010. Retrieved August 5, 2005. ^ Zonona, Victor F. (July 31, 1987). "$14-Million Deal : Microsoft Buys Software Competitor". Los Angeles Times. Archived from the original on October 26, 2016. Retrieved October 26, 2016. ^ "Microsoft Buys Software Unit". The New York Times. July 31, 1987. Archived from the original on April 20, 2015. Retrieved October 26, 2016. ^ "Obsolete Microsoft products". Archived from the original on July 6, 2006. Retrieved July 3, 2006. ^ "Windows History". Archived from the original on April 12, 2006. Retrieved July 3, 2006. ^ "OS/2 History". Archived from the original on July 20, 2006. Retrieved July 3, 2006. ^ "GrokLaw:The Novell Antitrust Complaint in text". Archived from the original on December 30, 2005. Retrieved October 9, 2005. ^ "Behind the Pearly Gates". Archived from the original on August 29, 2007. Retrieved July 4, 2006. ^ "Novell's MS complaint: we wuz robbed". Archived from the original on December 5, 2005. Retrieved July 4, 2006. ^ Harry McCracken (September 13, 2000). "A Peek at Office Upgrade". PCWorld.com. Archived from the original on September 7, 2005. Retrieved July 4, 2006. ^ "Feature: Brand Microsoft". Sales Promotion. Archived from the original on April 23, 2009. Retrieved April 2, 2008. "Microsoft Bob: the social interface". Soft-Letter. January 17, 1995. Archived from the original on January 10, 2009. Retrieved July 4, 2006. "Remembering Microsoft Bob". Archived from the original on July 5, 2006. Retrieved July 3, 2006. Michael Newman (May 23, 1999). "Bob is dead; long live Bob". Post-Gazette. Archived from the original on June 20, 2006. Retrieved July 4, 2006. Ken Polsson. "Chronology of Events in the History of Microcomputers: 1995+ Confusion". Archived from the original on May 15, 2006. Retrieved July 4, 2006. ^ a b "Top 10 worst products". CNet. Archived from the original on June 26, 2006. Retrieved July 4, 2006. "A History of Microsoft's Biggest Failures". Complex. June 2, 2009. Archived from the original on October 9, 2017. Retrieved October 9, 2017. ^ "Microsoft – The History of Internet Explorer". Archived from the original on October 1, 2005. Retrieved February 6, 2007. ^ "MSN Historical Time line". Archived from the original on June 18, 2005. Retrieved July 3, 2006. ^ "American Public Media archive". Archived from the original on December 9, 2004. Retrieved July 3, 2006. ^ a b c "Windows CE History". Retrieved July 3, 2006. ^ "Windows Server 2003: The Road To Gold". Paul Thurrott's SuperSite for Windows. Archived from the original on June 4, 2010. Retrieved July 3, 2006. ^ "Introducing MS Windows 98, Second Edition – Chapter 18". Archived from the original on January 23, 2008. Retrieved July 3, 2006. ^ "The Halloween Documents". Archived from the original on May 13, 2006. Retrieved May 18, 2006. ^ Bob Trott (November 6, 1998). "Microsoft pondering legal challenge to Linux". CNN. Archived from the original on September 3, 2006. Retrieved May 18, 2006. ^ "Halloween Document 1". Archived from the original on May 13, 2006. Retrieved May 18, 2006. ^ "U.S. vs. Microsoft findings of fact". Archived from the original on June 15, 2006. Retrieved May 18, 2006. ^ "The 25 Worst Tech Products of All Time". PCWorld. May 26, 2006. Archived from the original on September 14, 2017. Retrieved October 10, 2017. ^ "Windows XP Professional Features". Archived from the original on July 5, 2006. Retrieved July 3, 2006. ^ a b "Kinect Confirmed As Fastest-Selling Consumer Electronics Device". community.guinnessworldrecords.com. March 2011. Archived from the original on March 11, 2011. Retrieved May 19, 2012. ^ "Microsoft hit by record EU fine". CNN. March 25, 2004. Archived from the original on April 13, 2006. Retrieved May 19, 2006. ^ Dan Nystedt (December 7, 2005). "Update: Microsoft fined $32M by South Korea". IDG News Service. Archived from the original on January 18, 2006. Retrieved May 19, 2006. ^ Juan Carlos Perez (February 1, 2005). "Microsoft Spotlights Its Search Engine". PCWorld. Archived from the original on February 22, 2006. Retrieved July 4, 2006. ^ Robert A. Guth; Kevin J. Delaney (May 4, 2006). "With adCenter, Microsoft Bids For Web-Search Bonanza". Wall Street Journal. Retrieved July 4, 2006. ^ Neil McAllister (January 15, 2007). "Soft Sell for Open Source Apps". InfoWorld. Archived from the original on January 17, 2007. Retrieved January 15, 2007. ^ "Microsoft Announces Plans for July 2008 Transition for Bill Gates". Archived from the original on June 19, 2006. Retrieved June 16, 2006. ^ Richard Waters (June 15, 2006). "Bill Gates calls time on career at Microsoft". Financial Times. Archived from the original on June 17, 2006. Retrieved June 17, 2006. ^ "It's Official: Windows Vista RC1 Is Complete". Archived from the original on November 18, 2008. Retrieved September 1, 2006. ^ "Microsoft Updates Windows Vista Road Map". Archived from the original on March 30, 2006. Retrieved March 21, 2006. ^ Nate Mook. "New Windows Server, Visual Studio, SQL Server to Launch in February". BetaNews. Archived from the original on July 12, 2007. Retrieved July 11, 2007. ^ "Yahoo-Google agree online ad deal". BBC News. June 13, 2008. Archived from the original on September 16, 2009. Retrieved May 4, 2010. ^ "Microsoft mulls fresh Yahoo deal". BBC News. May 19, 2008. Archived from the original on January 15, 2010. Retrieved May 4, 2010. ^ "Microsoft Withdraws Proposal to Acquire Yahoo!". Microsoft.com. May 3, 2008. Archived from the original on November 14, 2012. Retrieved September 25, 2012. ^ "Microsoft to acquire Skype". May 10, 2011. Archived from the original on May 12, 2011. Retrieved May 10, 2011. ^ "Windows Phone 7 Series UI Design & Interaction Guide". March 18, 2010. Archived from the original on May 15, 2013. Retrieved October 9, 2010. ^ "Microsoft releases final test version of Windows 8". Business Line. Kasturi & Sons. June 1, 2012. Archived from the original on August 28, 2012. Retrieved August 4, 2012. ^ Rosoff, Matt (January 5, 2011). "OK, So Windows 8 Is Coming To ARM Tablets ... Someday (MSFT)". San Francisco Chronicle. Archived from the original on June 29, 2011. Retrieved January 5, 2011. ^ Sullivan, Mark. "Microsoft Announces New 'Surface' Tablet PC". PCWorld. Archived from the original on February 16, 2013. Retrieved June 19, 2012. ^ Acohido, Byron (June 25, 2012). "Microsoft buys Internet startup Yammer for $1.2 billion". USA Today. Gannett Company. Archived from the original on June 26, 2012. Retrieved June 25, 2012. ^ Thurrott, Paul (July 31, 2012). "Outlook.com Mail: Microsoft Reimagines Webmail". Supersite for Windows. Penton Media. Archived from the original on August 3, 2012. Retrieved August 1, 2012. ^ "Windows Server 2012 "Save the Date" Announcement". Microsoft. August 8, 2012. Archived from the original on November 7, 2013. ^ Venkatesan, Adithya; Mukherjee, Supantha; Leske, Nicola (July 16, 2012). "Comcast buys Microsoft stake in MSNBC.com". Reuters. Archived from the original on February 13, 2015. Retrieved February 13, 2015. ^ Rigby, Bill (October 1, 2012). "Microsoft launching news operation, new MSN". Reuters. Archived from the original on October 2, 2012. Retrieved October 1, 2012. ^ "Windows 8's delivery date: October 26". ZDNet. July 18, 2012. Archived from the original on September 19, 2012. Retrieved September 17, 2012. ^ "Mary Jo Foley: Windows Phone 8 launch date revealed". LiveSide.net. August 30, 2012. Archived from the original on November 3, 2012. Retrieved November 27, 2012. ^ "Microsoft prepping for complete brand and product line relaunch, New York store coming the 26th". wpcentral.com. Archived from the original on November 2, 2012. Retrieved November 3, 2012. ^ "Microsoft launches 'Patent Tracker' to help you search its library of intellectual property". The Next Web. March 28, 2013. Archived from the original on March 31, 2013. Retrieved March 29, 2013. ^ Pierce, David (May 21, 2013). "The all-seeing Kinect: tracking my face, arms, body and heart on the Xbox One". The Verge. Vox Media, Inc. Archived from the original on June 7, 2013. Retrieved May 28, 2013. ^ "Funky Friday: More than $32 billion in Microsoft stock value wiped out | Microsoft – CNET News". News.cnet.com. Archived from the original on August 22, 2013. Retrieved July 21, 2013. ^ "Microsoft buying Nokia's phone business in a $7.2 billion bid for its mobile future". Archived from the original on September 29, 2017. ^ "Microsoft names insider Amy Hood as CFO". Reuters.com. Archived from the original on April 9, 2014. Retrieved April 18, 2014. ^ Gibbs, Samuel (October 7, 2013). "Sir Tim Berners-Lee and Google lead coalition for cheaper internet". theguardian.com. Guardian Media Group. Archived from the original on October 19, 2013. Retrieved October 8, 2013. ^ "Microsoft's sweeping reorganization shifts focus to services, devices". July 11, 2013. Archived from the original on October 26, 2013. ^ "Microsoft CEO Steve Ballmer to retire within 12 months". Archived from the original on August 23, 2013. ^ David, Javier E (February 5, 2014). "Nadella named new Microsoft CEO as Gates era ends". NBCNews.com. NBCUniversal. Archived from the original on February 5, 2014. ^ "Microsoft to close its acquisition of Nokia's devices and services business on April 25". The Economic Times. April 22, 2014. Retrieved May 25, 2016. ^ Borges, Andre (April 21, 2014). "Nokia phone division to be renamed Microsoft Mobile, reveals leaked letter". dna. Archived from the original on October 15, 2016. Retrieved May 25, 2016. ^ Greene, Jay (May 25, 2016). "Microsoft to Streamline Smartphone Hardware Business". The Wall Street Journal. Archived from the original on May 25, 2016. Retrieved May 25, 2016. ^ Hutchinson, Lee. "It's official: Microsoft acquires Mojang and Minecraft for $2.5 billion". Ars Technica. Archived from the original on September 19, 2014. Retrieved September 19, 2014. ^ Frumusanu, Ian Cutress, Andrei. "Microsoft at MWC 2015: Lumia 640 and 640 XL Announced, 4K 120Hz Surface Hub Demoed". Archived from the original on September 27, 2015. Retrieved September 27, 2015. ^ Howse, Brett (July 29, 2015). "Windows 10 Launches Worldwide". AnandTech. Archived from the original on June 24, 2016. Retrieved May 25, 2016. ^ "Gartner Says Emerging Markets Drove Worldwide Smartphone Sales to 19 Percent Growth in First Quarter of 2015" (Press release). Gartner. May 27, 2015. Archived from the original on June 14, 2015. Retrieved July 28, 2015. ^ Howley, Daniel (May 25, 2016). "Microsoft needs to change its mobile strategy or get out". Yahoo! Tech. Archived from the original on May 27, 2016. Retrieved May 26, 2016. ^ Stuart, Keith. "Microsoft to unify PC and Xbox One platforms, ending fixed console hardware". theguardian.com. Guardian Media Group. Archived from the original on December 17, 2016. ^ "Microsoft announces new data protection tool to help enterprises secure their data". Tech Crunch. June 22, 2016. Archived from the original on June 22, 2016. Retrieved June 23, 2016. ^ "Microsoft has joined the Linux Foundation". Archived from the original on November 25, 2016. Retrieved November 24, 2016. ^ "Microsoft joined linux foundation with yearly platinum membership". Lock SSL. Archived from the original on February 2, 2017. Retrieved November 24, 2016. ^ Warren, Tom (November 11, 2016). "Microsoft joins the Linux Foundation, 15 years after Ballmer called it 'cancer'". The Verge. Vox Media. Archived from the original on August 16, 2017. Retrieved August 18, 2017. ^ Mehdi, Yusuf (January 24, 2017). "Announcing Intune for Education & new Windows 10 PCs for school starting at $189". The Official Microsoft Blog. Archived from the original on January 25, 2017. Retrieved January 25, 2017. ^ Frederic Lardinois (January 24, 2017). "Microsoft launches Intune for Education to counter Google's Chromebooks in schools". TechCrunch. Archived from the original on January 25, 2017. Retrieved January 25, 2017. ^ Andy Weir (January 24, 2017). "Microsoft introduces Intune for Education, promising simple setup and management of devices". Neowin. Archived from the original on January 27, 2017. Retrieved January 25, 2017. ^ Dellinger, AJ (June 8, 2017). "Microsoft Buys Cybersecurity Company Hexadite To Respond To Cyberattacks". International Business Times. Archived from the original on June 8, 2017. ^ "Microsoft agrees to buy U.S.-Israeli cyber firm Hexadite". Reuters. June 8, 2017. Archived from the original on June 9, 2017. ^ "Google goes bilingual, Facebook fleshes out translation and TensorFlow is dope - And, Microsoft is assisting fish farmers in Japan". ^ "Microsoft has signed up to the Open Invention Network. We repeat. Microsoft has signed up to the OIN". ^ "Microsoft co-founder Paul Allen dies of cancer at age 65". ^ "See this, Google? Microsoft happy to take a half-billion in sweet, sweet US military money to 'increase lethality'". ^ "Microsoft announces Project Mu, an open-source release of the UEFI core". ^ "Microsoft's 2018, part 2: Azure data centres heat up and Windows 10? It burns! It burns!". ^ Wong, Julia Carrie (February 22, 2019). "'We won't be war profiteers': Microsoft workers protest $480m army contract". The Guardian. This page was last edited on 17 April 2019, at 09:15 (UTC).